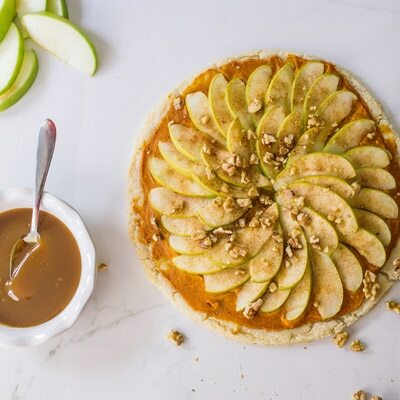 Invite the kids in your family to put this Pumpkin Apple Dessert Pizza together and they'll have a lot of fun! Filled with cream cheese, apple, pumpkin and chopped nuts, this pizza extravaganza will delight the whole crowd! PREHEAT oven to 325° F. Grease 12-inch pizza pan or large baking sheet. PLACE whole bar of dough on prepared pan. Allow to soften for 5 to 10 minutes. Using fingertips, pat dough gently to form a 9-inch circle. BAKE for 22 to 25 minutes or until light golden brown. Remove from oven; prick with fork. Cool on pan on wire rack. BEAT pumpkin, cream cheese, 2 tablespoons sugar and cinnamon in small mixer bowl until smooth. Spread over pizza crust to 3/4 inch from edge. Mix apple slices with remaining sugar and dash cinnamon in small bowl; place on pizza. Sprinkle with nuts. BAKE for 8 to 10 minutes; remove from oven. Drizzle with caramel topping. Cut into wedges; serve warm.